Archbishop Igara was born in 1951 in the Milne Bay Province of Papua New Guinea and was educated at the church affiliated Martyr’s Memorial School in Popondetta, and earned a Bachelor of Science in Electrical Enginering degree from the Papua New Guinea University of Technology in Lea (Unitech). He worked in private industry for several years, rising to Director of Engineering and Technical Services with the National Broadcasting Commission when he entered Newton Theological College in 1992 to study for the ministry. Ordained deacon in 1996 and priest in 1997, he served his title at Wamira, near Kaieta. From 1998 to 1999 he was the parish priest in Boianai and priest in charge of Alotau and vicar general of Dogura from 2000 to 2009. He was elected the first native bishop of the Diocese of Dogura and was consecrated on 28 June 2010. At the 14 June 2013 meeting of the ACPNG provincial council he was elected archbishop and primate in succession to the Most Rev. Joseph Kopapa, who retired in December 2012, and was installed on 20 June 2013. 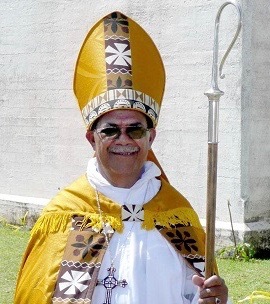 Upon his election he resigned as Bishop of Dogura, as required by the church’s canons, and as archbishop is based in Port Moresby but has no diocesan see. He is married to Miriam and has 5 children and 5 grandchildren.